Miles for Migraine <http://milesformigraine.org> is a non-profit organized to improve the lives of migraine patients and their families by raising money and public awareness and helping find a cure for migraine. The June Challenge is a virtual event. Participants from anywhere and everywhere run (or walk) to raise money for sorely-needed research. This year I decide to take the challenge. 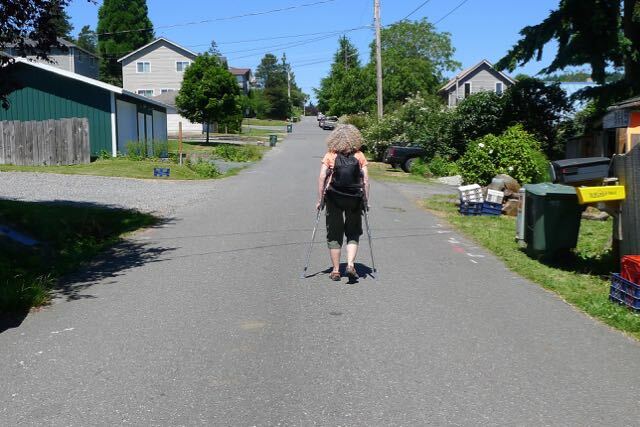 I set out to walk almost every day, both to contribute and as a personal challenge, to explore my own ability to set one foot in front of another and day after day make a personal commitment. In 2012 I tripped and fell going down the steps to the basement. It was a hard landing that resulted in a soft-tissue, foot injury, and subsequent re-injuries requiring physical therapy, orthotics, crutches and five years to heal. It's a long story on its own, with many frustrating setbacks. 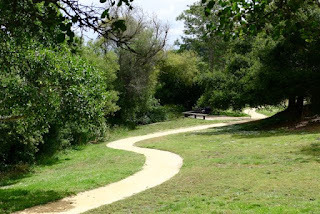 I love to walk, and it has been a harsh blow, added to incessant migraines, to be deprived of such a simple pleasure and a means of coping with chronic pain. Finally, this spiring, after several more months dedicated to exercises by Eric Miller, my superb physical therapist, my feet began to take me further and further without protest. I was ready for a challenge, excited to have a goal and make a contribution. On June 1st my husband joins me in my mini crusade, and we begin to walk everyday around our neighborhood, down to the Bay, the library, around town (to New Orleans). It feels great although migraines and subsequent fatigue continue to limit the miles I clock via Strava, an ap that not only counts your miles and route but also feeds the information to Miles for Migraine and to followers. June 5th my husband and I set out on our annual road trip to California to visit our son in Santa Cruz. First night in a yurt at Champoeg State Park south of Portland, Oregon, a big, expansive, rolling green park on the Willamette River. We clock 2 miles through oak and maple woods, along the river. Second night, Crescent City, California, a favorite stop for us. We log 3.2 miles walking the lovely, long beach across Hwy 101 from the Curley Redwood Inn, where all the awesome woodwork (doors, paneling, trim, tables, headboard on the bed) was milled from one giant California curly redwood tree. Third night we are home-away-from-home free in Santa Cruz. Every day for a week we walk beachside West Cliff Drive to the lighthouse, to Natural Bridges Park, the neighborhood taqueria, a woodsy trail to the old lime works above Felton, around wildlife refuge Neary Lagoon, to Vasilis Greek Restaurant. My mileage climbs from 1 or 2 to 4 or 5 miles at a whack. I am feeling good! 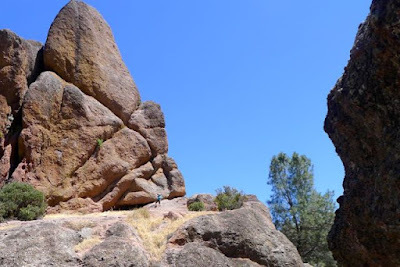 After a week with Andrew and Jenny we head over to Pinnacles National Park on the San Andreas fault, scene of spectacular, craggy red rock, sprawling old oak trees and abundant wildlife. We pick out a campsite and set up our brand-new, spacious tent. The next morning, on a short hike, we head up a rocky trail, strewn with boulders and cave-like rock falls to a gem of a reservoir where we lay eyes on brilliant red and blue dragon flies flitting the surface, water snakes, frogs and Easter Island-like rocky heads. On the way down, I take a short hop off a rock and feel a little twinge in my left groin area. "Hm, I won't do that again," I think. After a late afternoon swim in the campground pool, we have chicken salads and Andrew's home-baked sour dough bread for dinner. We watch the sun go down and the stars come out and turn in early. The next morning I get up with pain in my hip crease every time I take a step, so we abandon our morning walk and hit the road, driving north on 101, heading toward home. It is a long, stop-and-go day as we battle traffic jams from Watsonville all the way through San Francisco and over the Golden Gate Bridge at rush hour. We finally throw in the towel in Petaluma and get a hotel for the night. Over the next few days, with a sinking heart, I quit walking as the pain in my hip grows progressively worse. We skip stops at favorite swimming holes on the Eel and Smith Rivers. Arriving home, I have my husband dig my crutches out of the basement and schedule a doctor's appointment for the next morning. Diagnosis, soft tissue injury requiring at least 6 weeks to heal. This is all too familiar territory. When the doctor says 6 weeks, I hear 5 years and an end to my newly acquired walking ability, a summer without swimming or bike riding. I have a major meltdown. Oh, Candy! Very disappointing. It brings me a little tear, because, well because I'm kind of feeling sensitive right now, and I really relate. Although I don't have the same complications, I have suffered come of the same things this summer: chronic headaches and a soft tissue injury (sprained ankle) while on a road trip with Jim through the Southwest)--from hopping off a boulder. There was no "next day" wait to find out I was screwed (it swelled up like a hemophiliac's injury!) However, I only had a few days on crutches to find out if it was broken, as we were in the middle of nowhere-ish in a campground (Chaco Culture Historical National Park, much recommended for the ruins!). Thanks, Donna! Hope you're hopping around now - or at least ambling around easily on two feet. I like to write, do art, teach English, listen to the stories of my students. More and more I find that giving full reign to my creative side helps me live with migraine disease. Listening to people's stories is endlessly fascinating and connects me with everyone. MAGNUM: The National Migraine Assoc.